Our Drama Literacy Program is an innovative children’s theater program that serves thousands of elementary and middles school children every year. The programs encourages students to put into direct practice, through a language-based art form, the literary skills they are learning in the classroom. Professional instructors work hand-in-hand with the school’s teachers to help students with comprehension, interpretation, and teamwork. Students also love the opportunity to perform plays for their peers, parents, and local community! 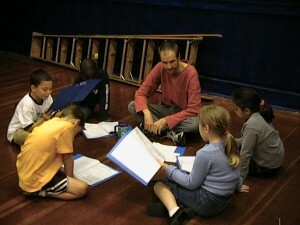 Students taking part in the creation, rehearsal, and performance of a play provides them a unique experience to boost their literacy skills, their confidence and creativity, their ability to work collaboratively, and their interpersonal skills, all of which are major assets that will serve them well in the future. To bring this enriching program to your location, please contact us. 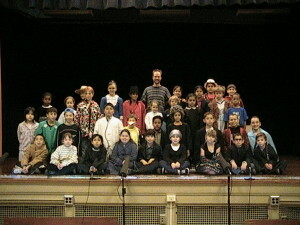 Drama Literacy Programs have run at D. A. Grout Elementary (every year) since 2003; 6 years at Lewis Elementary; 3 years at Roseway Heights School; and 1 year at Laurelhurst School and Cottonwood School. Here’s an outside perspective on the Drama Literacy Program from volunteer Linda Chase, during her One-Week Job Project. The information below represents how the program has typically run in the past, but any aspect of the program can be modified to match your school’s specific needs and goals. Contact us to request a quote and bring the Drama Literacy Program to your school. 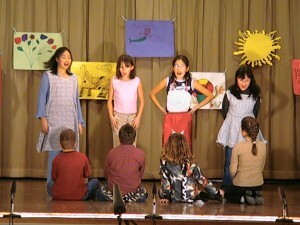 At the end of the 2-7 week session, students perform their plays once for the entire school and again in the evening for their parents and families. Grout Elementary students also perform at a retirement home across the street. 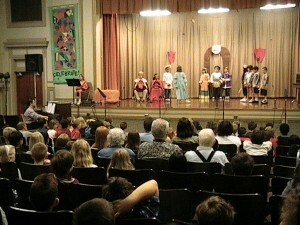 Performances include basic costumes, props, and sometimes scenery that the students make themselves. Typically, K and 1st graders do not perform. We want them to be comfortable on stage and learn the basics of acting and performing without the pressure of having to perform for others. Usually, we work with these age groups for 2-3 weeks. However, if your school wishes them to perform, it can be arranged. Middle school workshops sometimes occur after school. Remember, any of the above details can be modified to match your school’s specific needs and goals. For a price quote and more information about bringing this program to your school, fill out the Inquiry Form or contact us directly. At D. A. Grout Elementary since 2003! It also ran at Roseway Heights for 3 years and Lewis Elementary for 6. New Moon’s Drama Literacy Program is a masterful combination of literacy enrichment, positive youth development, leadership development, and theatre training. Families and friends enjoy the show.